We learned it from Chubbs… “It’s all in the hips.” When looking across all athletic performance this rings true. That’s because the hips are the powerhouse for the human body. The hip is a combination of big movers and smaller stabilizers that work together to generate both power and balanced movement. And who could forget about “The Core”? It’s actually made of more muscles than just 6-pack abs and it’s function extends far beyond looking good naked. It maintains the spinal curvature to prevent injury and is essential for athletic performance by transferring power through the torso to the extremities. Unfortunately, we tend to sit too much, and training is often too one dimensional, which leads to impairments of the hip and core. This not only limits performance but often leads to back and knee pain. Learn more about the common weak links that contribute to pain and injury…and what could be holding your performance back. A weak glute max leads to poor hip extension. The lumbar erectors then have to pick up the slack, which often leads to low back pain. Tightness or weakness of the glute max can lead to lateral knee pain because part of its tendon forms the IT band. The glute max also works with deep core stabilizers to stabilize the important junction of the pelvis and spine (ref). 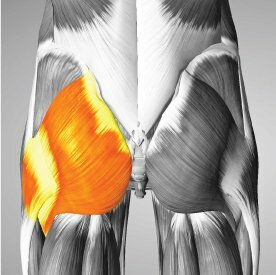 These two muscles lie deep in the gluteus maximus and primarily lift the leg away from the body. It also has a secondary role of internal rotation of the hip. The most powerful of the deep rotators. When the hip is extended it works in conjunction with the other external rotators of the hip (especially glute max). When hip is flexed, the piriformis switches to an internal rotator and performs abduction. It also co-contracts with the glute med/min to create stability at the hip joint. Weakness of the piriformis results in internal rotation of the femur which creates a dangerous position for the knee. It’s can also lead to poor pelvic control during walking/running. The sciatic nerve passes directly under the piriformis (in 15-20% of people it actually splits the piriformis). 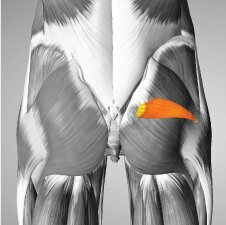 Tightness of the piriformis can result in piriformis syndrome, which generates numbness and tingling down the leg. 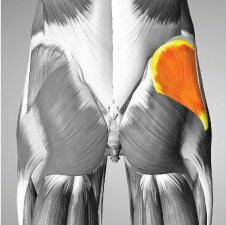 Better known as the TFL and located at the anterior lateral aspect of hip (basically under your front pocket.) It’s primarily involved in hip abduction (lifting to the side) and becomes more active with hip flexion (knee to the chest). It also works as an internal rotator and hip flexor. Its tendon joins the gluteus maximus tendon to create the IT band. Often tight from prolonged sitting – tightness can increase the risk of IT band syndrome as well as cause a pinching in the front of the hip during squatting. Overuse of TFL rather than the glutes (specifically glute max) creates femoral IR and increases the risk of knee injury. This is the ultimate buzzword in the fitness world, primarily used as a code word for 6-pack abs. But more importantly, it’s a large combination of muscles, both big and small, that move and stabilize the spine. 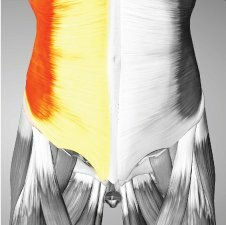 We won’t get into the specifics of each muscle here, but it’s important to understand the core’s role in torso stability. Consider the stability of an unopened soda can, it is really hard to crush. But if you compromise the can by opening it or denting one of the sides, then it is much easier to crush. The core is similar, four sides and a top and bottom that work together to create stability with mobility. Low back pain is extremely common with more than 80% of people experiencing at least one episode of LBP in their lives (most of these being recurrent.) Most common pain generators are muscle spasms, facet joint dysfunction and disc pathology. 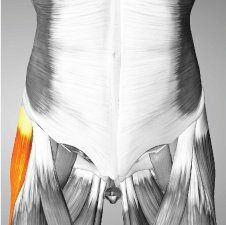 Research shows that gluteus medius is weaker in those patients with LBP than those healthy controls, as well as implantation of a glute strengthening program in addition to segmental lumbar stabilization has shown a greater decrease in lower back pain, more than segmental stabilization or hip strengthening alone (ref). You’ve learned a bit about what’s going on beneath the surface, but it’s more important to understand how these issues reveal themselves. This is an especially dangerous position for the knee, commonly recognized as the knee caving inwards. Dynamic valgus results in many types of knee pain, meniscus tears, and increases the risk of ACL tears. Knee valgus is commonly misunderstood as an issue with the knee joint, but it’s actually caused by impairments of the hip. As discussed above, maintaining proper alignment of the knee starts by stabilizing the pelvis and the strength to support the femur under the bodyweight. This becomes even more pronounced during a single leg stance, especially when under fatigue. The quads (the muscles on the front of the leg) often dominate over the hamstrings and glutes. This combination of quad strength vs. a weak posterior chain is a common issue in those experiencing back and knee pain. The laws of physics say an object in motion stays in motion. For human movement, this means if you are moving quickly in one direction and suddenly stop, the momentum of your body still wants to carry you forward. This is notably seen in multi-directional sports like soccer, football, or even playing tag with your kids. Changing direction quickly and safely requires a different level of core strength and stability than just bracing your abs hard. It requires strength and coordination to fire a lot of muscles simultaneously.